I'm looking for a way to forward to the next song after the current track has played for 2min. In the image above you can see all the attempts I tried including: "120-", "00:02:0-00:00:00" and "-00:00:0;00:02:00-"
The only one that actually did something was the genre query mentioned above. To skip specific parts of a track. you actually have to tag your files with a SKIP tag. SKIP=-<time> to skip from the beginning to <time>. SKIP=<time>- to skip from <time> to the next track. SKIP=<a>-<b> to skip from position <a> to later position <b>. SKIP=-<a>;<b>- to skip from start to <a> and from <b> to next track. Thank you so much for your awesome help. It worked. Actually both approaches will be very useful indeed. Foobar is just amazing, isn't it!? Is there a way to have Skip Track skip so that the same artist doesn't play twice in an hour? Or even a 5 track span? foo_skip causes infinite repeat of a song, and it does happen with several songs, but only when foobar2000 advances to the next track automatically. But it does not happen when I advance to the next track manually. I have tried various options to get rid of the "bug", but I cannot get rid of my problem. I've tried to change audio output to Direct Sound, I tried WASAPI (event) and WASAPI (push), even tried Null oputput, but that made no difference. So it can't be related to my soundcard. 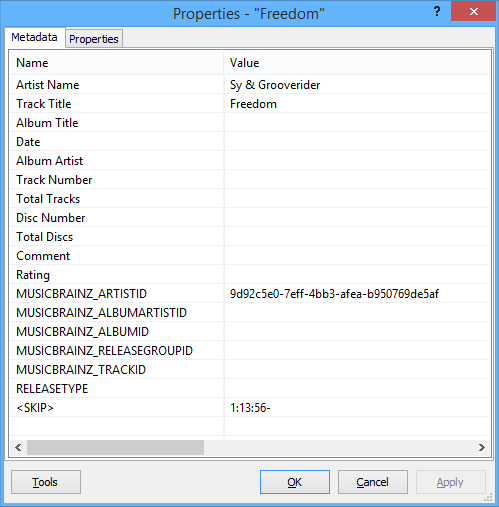 I made a portable install of foobar2000 v1.3.10, but the same problem appears. 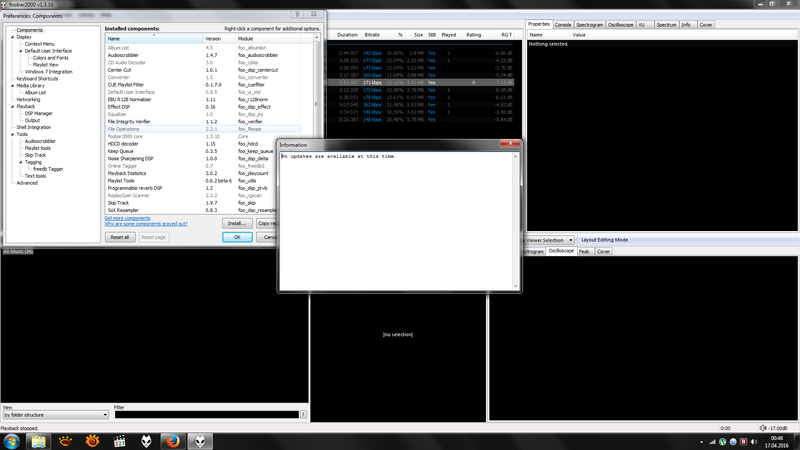 I'm running foobar2000 on Windows 7 x64. 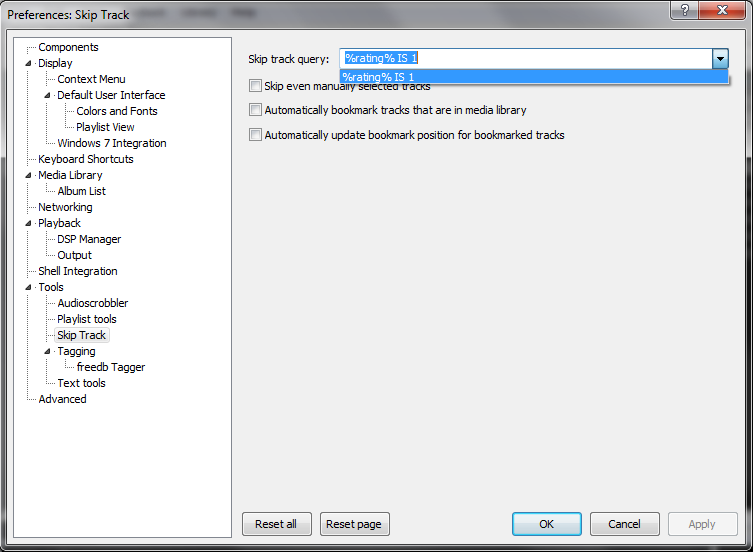 You most likely set up a bad query in 'File/Preferences/Tools/Skip track/Skip track query'. Or it's the default one which as I remember is something along the lines of 'skip track if RATING is 0' and your files happen to have that. So post the query and the right click/properties window of your problematic files (so we can see the tags). I do not use rating-tags, but my rating goes to the database (playback statistics). Using Previous command after skipping a track seemed to be buggy in the old version of the component. I uploaded a version with a fix but it's so far only available on my site. I'll put it on the official component repository when I wake up. I would like to add a button that toggles the skip function. Is there a value I can refer to in titleformatting that tells me weather the skip function is on or not? That's fine, I understand the same command enables or disables the component, but I would like the command button to show different icons according to the component status: a brighter one when the skip function is enabled and a darker one when it is not. I'm using the $imagebutton function of the panel stack splitter, therefore I need a value I can use in an if statement that tells me whether the component is enabled or not, just like I have for the shuffle and repeat mode command buttons. Actually I just realised that the playing order status is a specific panel stack splitter reference, so I guess what I'm asking for is not possible. Hello, I have a problem, if anyone could please help? This plugin used to work fine for me a few years ago. Right now I've just installed the latest version (1.9.8 ) and I can't get it to skip anything. None of these results in anything being skipped at all. I wonder why? I get it now: Foo Skip will skip the song if the query result is true. I was thinking it skipped if the query returned a value of 1. I feel that perhaps the documentation could make this "must be true" a little more clear, perhaps with a couple of examples, for the sake of dummies like me? It didn't help that when I installed the plugin, the query box was blank, possibly because I was upgrading from a very old version. I guess everyone just missed out the "IS 1" in this thread because it's obvious when you know it should be there. I just want to thank Case for his help in the past. Looking back through this thread, I can see that 4 years ago I asked for a way of using random numbers to allow higher rated songs to be more likely to play. 3 months after that (by which time I had given up and stopped checking the thread) Case very kindly added the $rand() function and provided the exact code I need, which I am so happy with, thank you! Actually the probability skipping is possible since January. I have a question regarding the effect of your component on replaygain scanning; If I add a SKIP tag to a file to skip the beginning of a track (e.g. <SKIP> = -0:08:00), and then (re)run replaygain scanning on said track, will the "skipped" part of the track then be ignored during scanning? I think this should be the desired behaviour, but is this what happens? The component won't affect ReplayGain results. A postprocess decoder could perhaps cheat the scanner and return silence for unwanted parts but I believe postprocessing is only performed for a certain limited number of formats. If you think the results are way off because of skipping you could use Converter to write a temporary file and run a scan on that file. 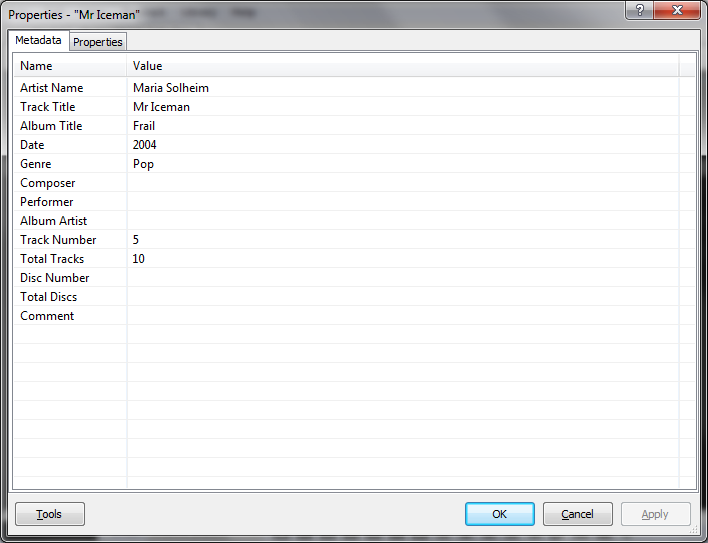 Then copy the RG numbers manually over. OK, thanks for clarifying that Case! I've been using this component to play excerpts of long classical tracks for my radio show, and I'm really enjoying it thus far. I did come across a bug, however. Whenever I end a track early through <SKIP>, it doesn't affect the "stop after current" playback option; it just goes on to the next track. I did some testing by playing with automatic fade-outs, and it looks like cutting the track off early counts as a manual track change. Maybe there is some way to make foobar recognize it as an automatic track change? Also, if anyone else is interested, I made a custom column which shows the length of an excerpted track. I'll paste the pattern below. One caveat: the <SKIP> field must have the format -MM:SS;MM:SS- (a start/end time of 00:00 does nothing, I've found). What I want to do now is have some way of quickly displaying the actual duration of my playlists. I can't really find any obvious way to do this, so if anyone has tips, they'd be greatly appreciated. ...What I want to do now is have some way of quickly displaying the actual duration of my playlists. I can't really find any obvious way to do this, so if anyone has tips, they'd be greatly appreciated. You have that feature built-in foobar2000 Playlist Manager.